Many Sindhis begin their Sundays with a visit to roadside food cart for a hot , king sized, breakfast, fit to celebrate the holiday mood. The breakfast served on a lazy Sunday morning, at almost every nook and corner of Sindhi localities, happens to be either Dal pakwan, Dal moong, or else Chola Dhabhal (Chola = Chickpeas or Garbanzo beans, and Dhabhal = Bread). 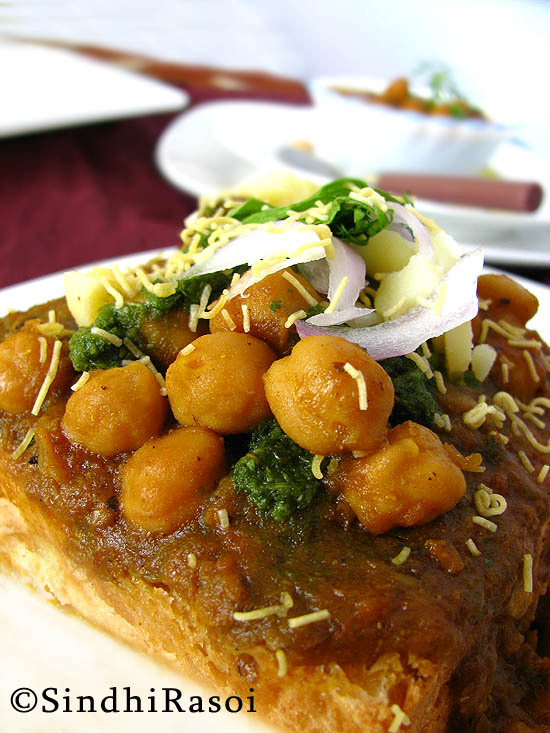 The cart selling this curry-bread, have a hot stove with a large Aluminum container, filled with Spicy garbanzo curry cooked in Indian style Onion and tomato curry, oozing with flavors of roasted Garam masala powder, arranged on the sides of the container. The center of container is intermittently filled with dilute version of the gravy, a portion of thick curry(with beans) is then mixed with dilute gravy, and allowed to simmer for a while. The Soft dinner rolls or Ladi pav is then torn into two, dunked in the simmering gravy , coated well with the curry and then carefully picked up and plated. Few spoons of tender chickpeas thrown over the juicy bread (generally Pav, but some vendors serve bread slices too), topped with tangy mint coriander chutney, sliced onions ( at times chopped tomatoes, boiled potatoes too), some trademark spices sprinkled like a magic powder, followed by the crunchy nylon sev, and finally garnished with chopped coriander leaves. Another version of this breakfast, called Dal Chola Dhabhal is also very popular where lentils are also used along with Chickpeas. But we will talk about that sometime later. Kindly note: The recipe below is not a traditional Chola recipe. It is more like a Punjabi style chole. 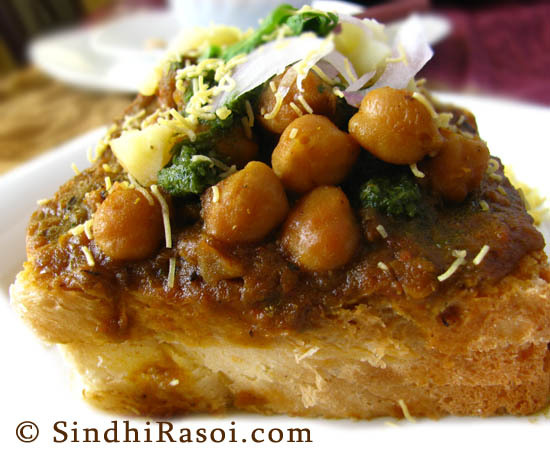 Shall share typical Sindhi style Chole recipe soon. Cool and grind to make a paste.Add chillies along onions. Now in same pan take some oil and a bayleaf. After 4-5 seconds, add ginger garlic (paste or pounded). Cook for a while and add onion paste. 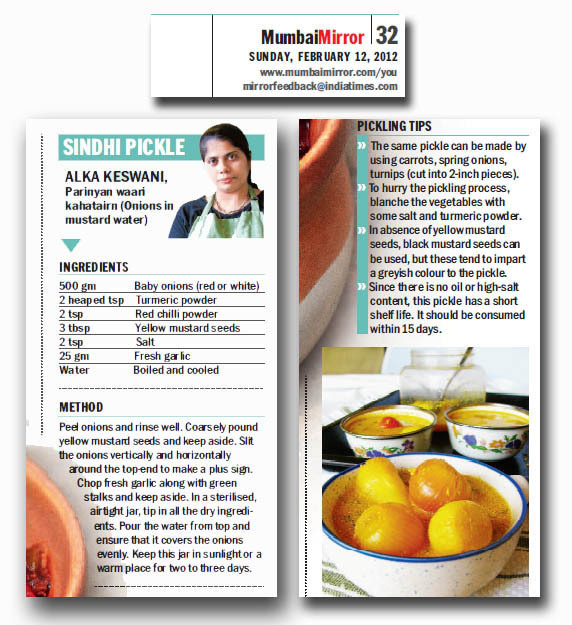 PS: I am pleased to share with you all that the Favorite pickle of Sindhis, Pariyan waari khatairn or Onion in Mustard water pickle, shared by me, was featured in Mumbai Mirror (Times Of India) Newspaper, 12th Feb 2012 Edition. You can view the paper online by visiting TImes Of India website. Tried it. Was well appreciated by family. 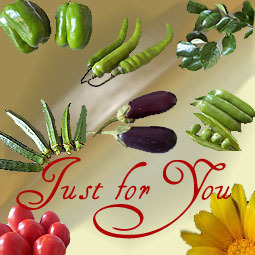 Thanks for a delicious fare. Please keep this rolling. 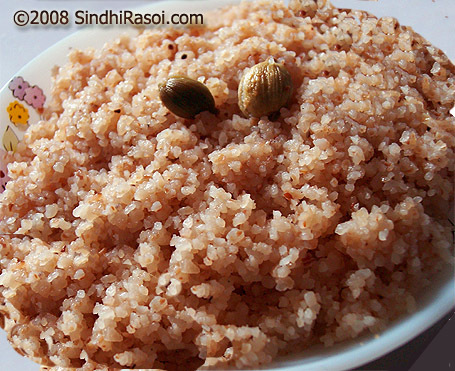 lovely breakfast.loved by non-sindhis also. 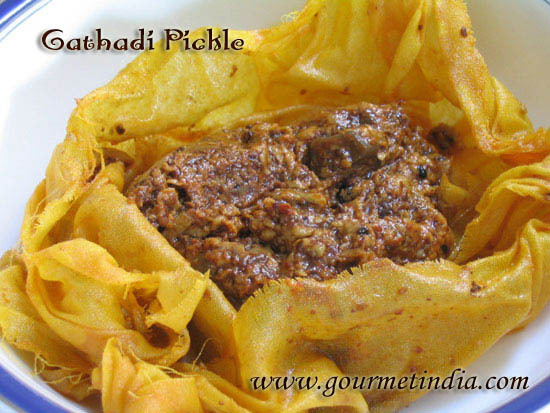 Lovely, pls share the complete recipe for Dal Chola Dhabal. Also, getting soft (dhabal) in Delhi is an issue, pls suggest where can we get ? Wow..looks mouth watering…..i think i have all the ingredients in pantry…will try this down….Congrats on featuring in paper….rock on…. lovely king size breakfast fare alka, have to prepare this for a weekend brunch.